I've been raving about salads recently. I've been eating a lot of them and telling you to forget about soups and embrace salads with me, I even had the most gorgeous salad in Pizza Express on Sunday night instead of pizza. I know, I know. Now I'm telling you to eat soup. The trouble with salads are Cooper doesn't like them. He likes cucumber, carrots, sweetcorn and red pepper, but that's it. If I put down an exciting mixed dressed salad with avocado, beetroot and asparagus in front of him he just wouldn't eat it and I need him to have have a variety of veg in his diet. I still add vegetables to his smoothies and the salad he does like into packed lunch with some falafel or veggie sausages, but he needs something different in the evening. So soup it is. This is a really simple soup that is creamy and has a sweetness from the sweet potatoes and carrots and a warmth of spice to even that sweetness out. I blended this one until it was smooth and served it straight up, but it would be good with a swirl of coconut milk or cream (dairy or dairy free). Serve it with crusty bread, crackers or a salad, it's your choice, but do try it. 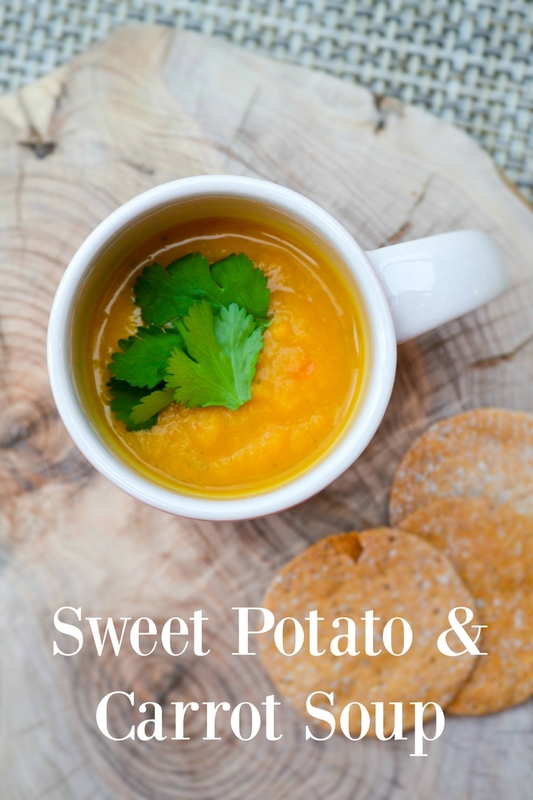 A creamy soup with the sweetness of sweet potatoes and carrots, balanced with the warmth of spices. Easy to make, nutritious and tasty. 1. Saute the onion and garlic in the olive oil in a large pot until soft. 2. Add the carrots and sweet potato and cook gently for a few minutes, then add the spices and pour in the stock.3. Bring to the boil, then reduce to a simmer and cook for 30 minutes. 4. Add the herbs and blend until smooth, then season with salt and pepper5. Enjoy! If you enjoyed this soup, try some more of our family favourites. After today's low clouds and chill (my car's temp gauge thingy said 11, but I didn't believe it) I have reverted temporarily from salads to soup too. This looks lovely and comforting, Jac. The spices really complement the sweet vegetables. Ah I'm glad it's not just me Kellie. Yes temperatures are supposed to be higher, but as the sun goes down it get's really cold. Yes, it is good. And today is one of those days. Wet and cold. Yes it has been really chilly and soup is perfect when it's cold like this. Mmm now this is my kind of soup recipe! I do like the addition of cumin - my favourite spice! Mine too Elizabeth, I use it lots. It adds such a lot of flavour. This is my kinda soup as I am addicted to all orange vegetables. Plus it is very rare for me to have everything to make a recipe but I actually can make this one now. Perfect! I do hope you make it and enjoy it then Bintu. Oh wow that sounds good, I'll have to try the roasted vegetable version. I bet it tastes totally different to this one. I really love carrot, but I'v never thought that it could be soup. :) I'll try your recipie for sure. Thank you for great idea! Carrots are fabulous in soup Claire. 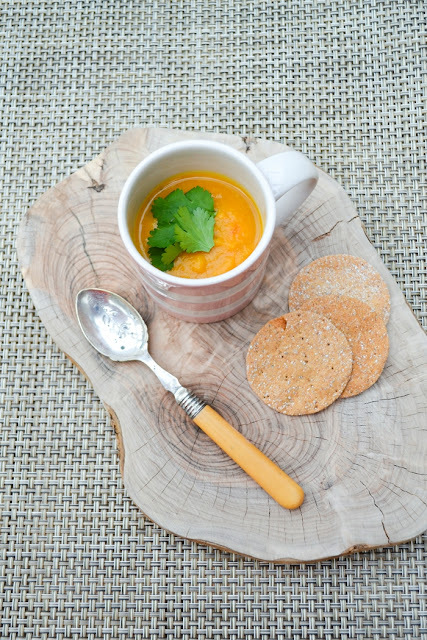 If you search for carrots in my search box you will see lots of delicious soups with carrots as well as this one. Thanks Aimee and yes it is very comforting and tasty. Just reminded me I've got a drawer full of sweet potatoes! Children not eating salad is something I deal with too. My daughter is 17! This is one of our favourite soups too. It's really creamy and feels much more indulgent than it really is. Looks a very luscious soup Jac - perfect for this inbetweeny time of weather!